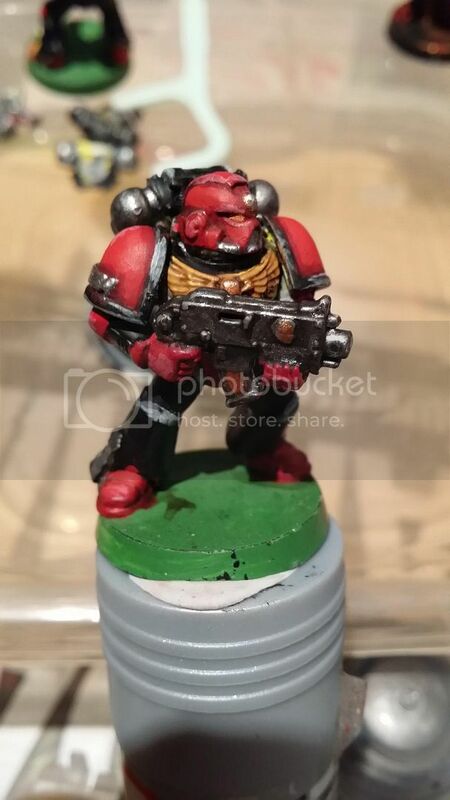 This is one of my Marines painted about a decade ago or so by my Dad, I decided to see if I could touch it up with the base paints I have and a wash to get it to a decent state and ready for highlights. As you can see I originally had some halved helmets but have since abandoned this idea as it is not fun to paint I think once the eyes are finally done yellow on the repaint the model will pop a lot more as it's a little dull presently. The Red is still a little dark for me but I don't actually own any other paints yet! Any comments welcome! 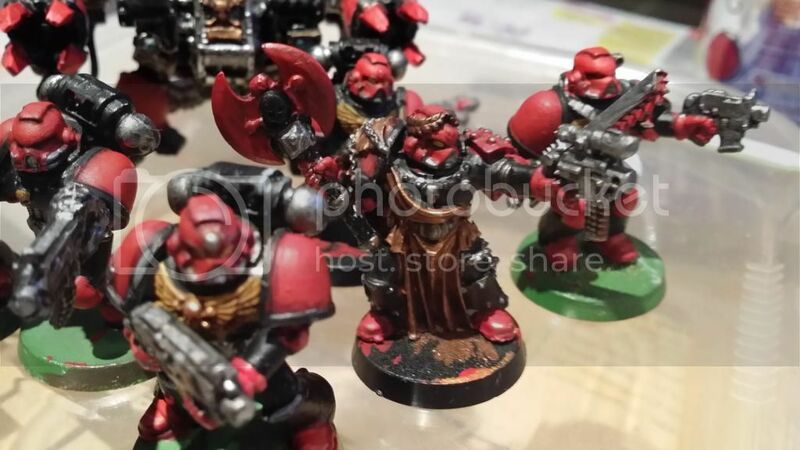 I'm still new to painting bar some messy Plague Marines years ago (where I could get away with messy!) so any tips appreciated! 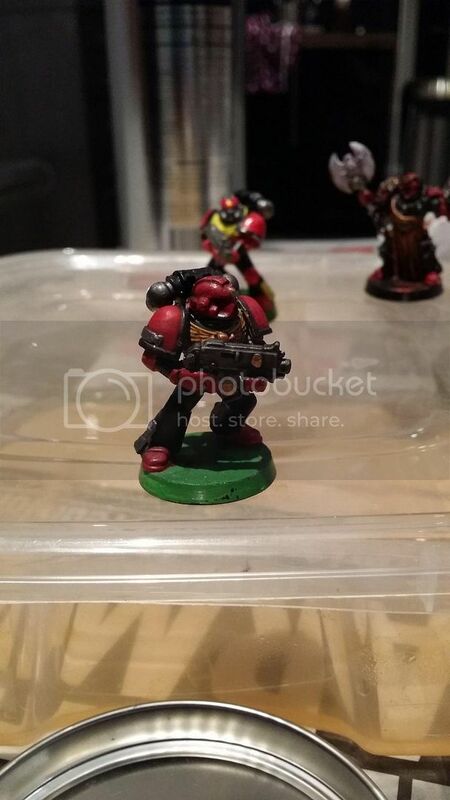 And does anyone have a good idea for basing? 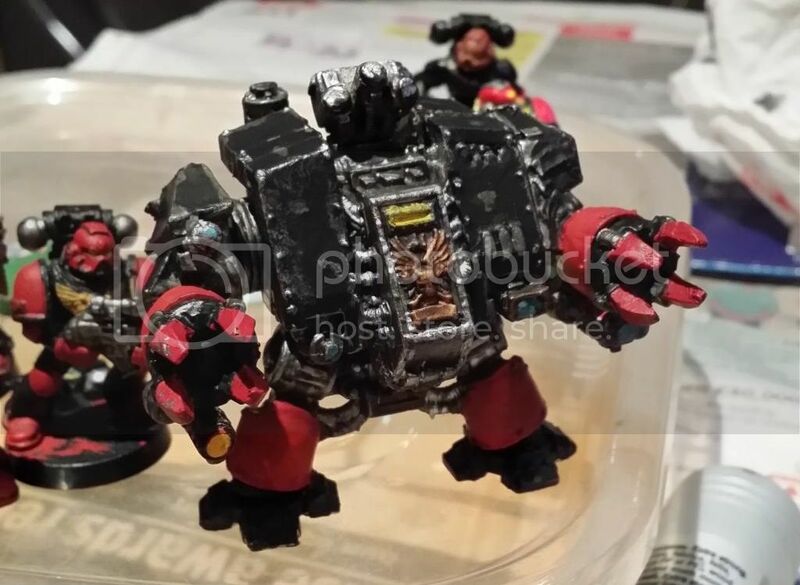 Was most likely going to go with a grey rocky/ cityscape one but I don't want my army to be too black. Edited by Charlo, 07 January 2019 - 08:29 AM. If you want to strip models, I'd recommend detoll. 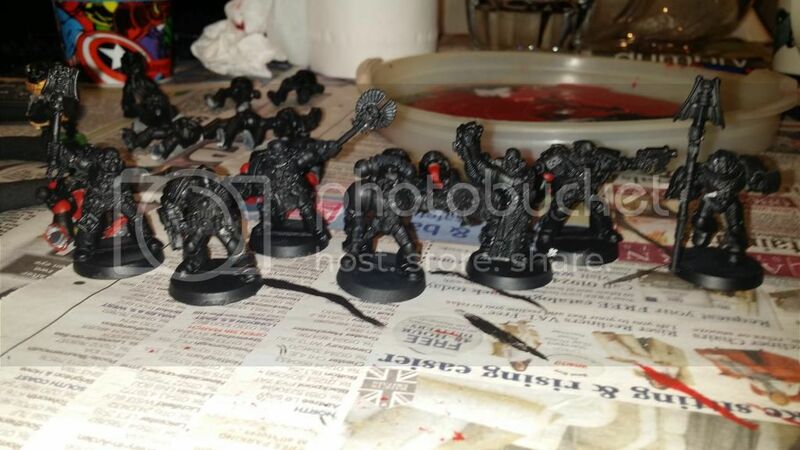 I did a whole bunch of guys for about £3.50, and if you strain out the bits of paint you can re-use the stuff. Oh really? Does it work on Plastic? If so which kind of Detoll?! Awesome! As with the above I've found painting over it didn't turn out too bad with all the details intact! People leave them in dettol for a week? I had my guys out after about forty minutes and the paint was as loose as you like. As usual any tips & comments welcome! Next update will hopefully include a chunky metal Furioso! That's not bad. I think the paint may be a little thick around the boltgun, but the edge highlighting works well. It was going over some previous paint that was slightly thick... So that's why! 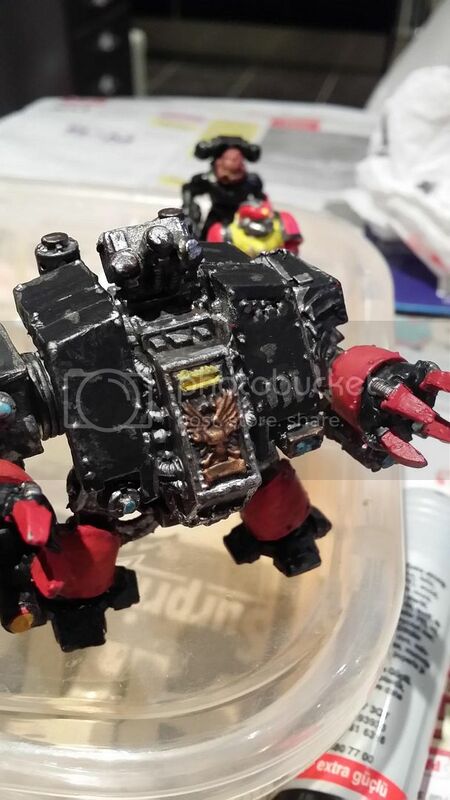 Got some work done on the DC/ Furioso dread today. He's one of the old school metal ones so very chunky and heavy! 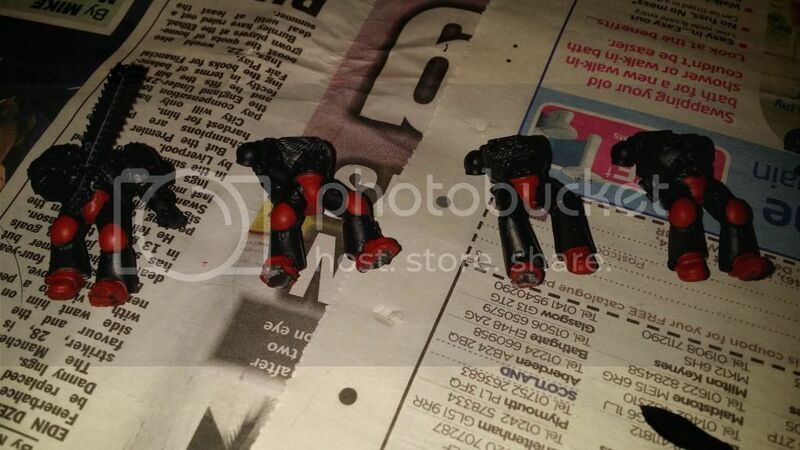 Need to do a bit of wear and tear on the red armour as it's too pristine at the moment. 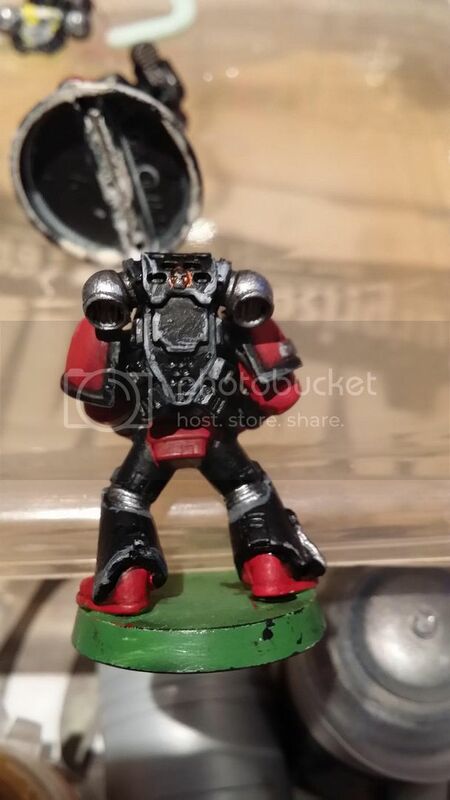 That said, besides a few errors, I'm quite happy with the thin silver edge I managed to get around the black armour! Thin your paints. 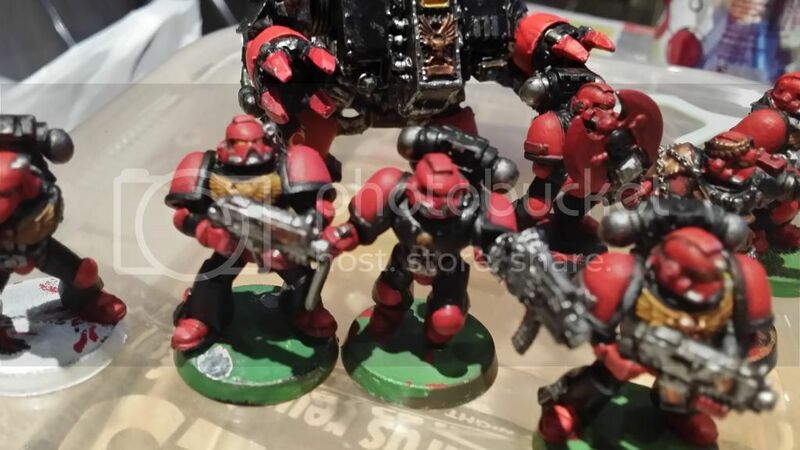 A lot of the models have a very thick, textured covering of paint, which looks as though you tried to get your desired tone in a single coat of paint. Thin your paints (a tiny touch of water works fine for acrylics) to a milky consistency, and take your time with multiple layers if you have to. You get a much smoother, flat finish. 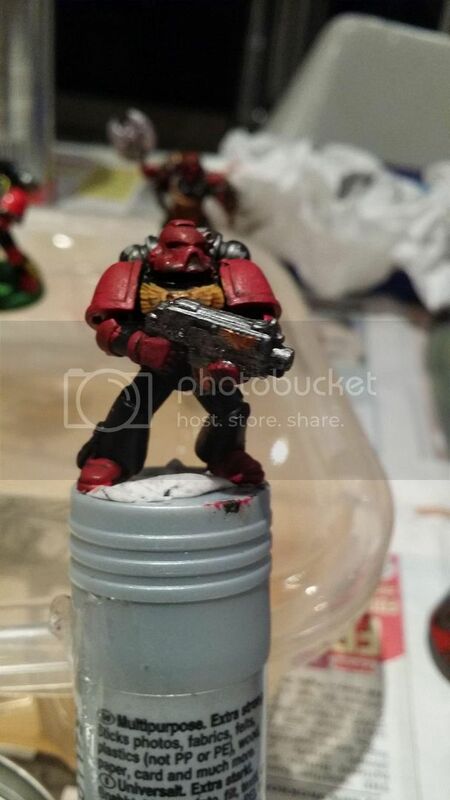 With edge highlighting, try using the edge of the brush rather than the point. If you slide the side of the brush along a corner, you leave a clean, straight, thin line (assuming that you don't have too much paint globbed onto the brush). You simply can't do this with some edges on account of their location, but it's good to do whenever possible. 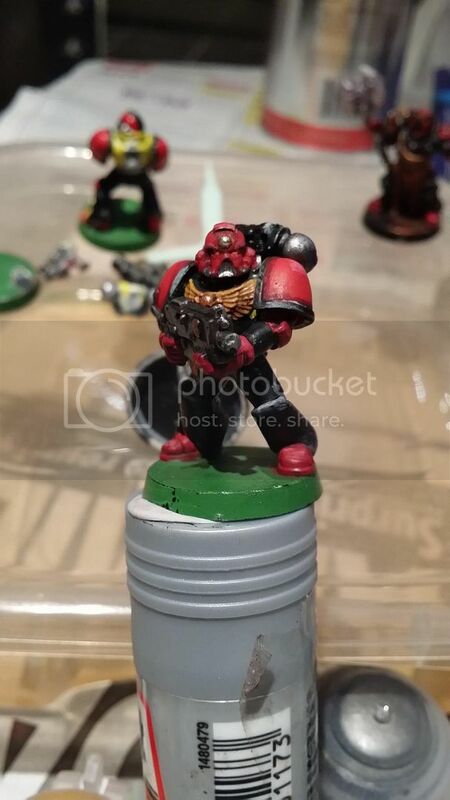 It may be best to use a color for your power weapons that isn't the same as your model's armor. 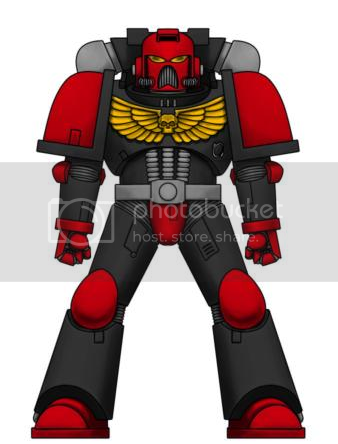 For a red paint scheme, good colors for power weapons could be blue or green. They contrast well. Basing a model does a whole lot to bring the look together, even if its just a simple layer of sand and a touch of static grass. I've been thinning my paints and the thickness is coming mainly from the underlying paint that's been on a few of the models for a long time! But I am trying everything a little bit thinner each time to see what I can get away with, not touching any new models until I've got the basic stuff down for sure. Power weapon colour is far from final, if iIm honest I painted the axe red because I was sick of it being this poorly under-coated white and a little bored waiting for other things to dry. They will probably be either purple or blue (Think Mace Windu Lightsaber) although I am open to trying some green. Bases will be done eventually all together. The green is again from about a decade ago, I'm thinking either brown desert or grey rubble for bases. 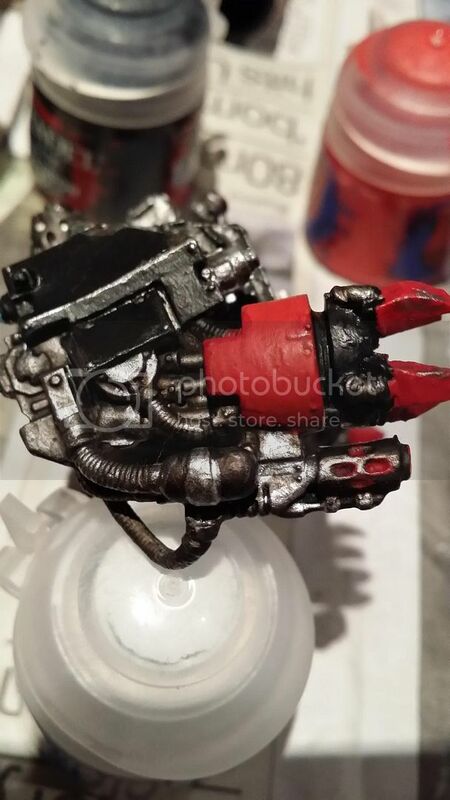 I'll keep the edge technique in mind, I did discover this while doing the Dread but haven't got the edging of other models yet surprising how "easy" it is though with a little patience. One thing I can't wait to do is not have to paint fully built models with bolters obscuring chest eagles and such! 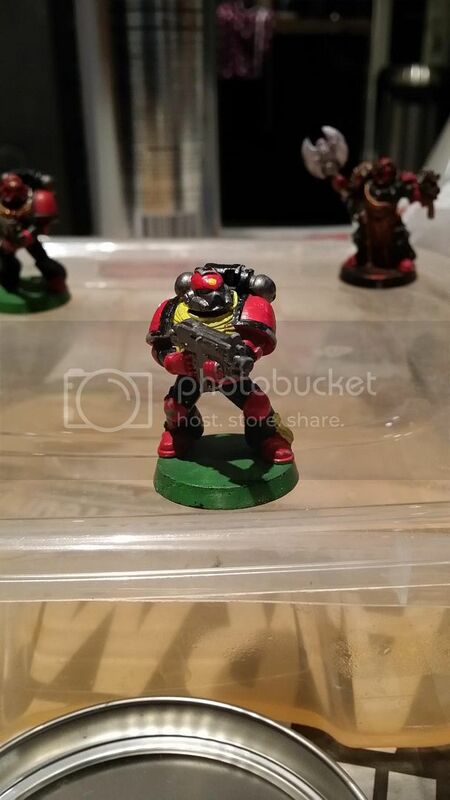 I'd echo what firepower said about thinning down your paints a little. When I learnt to do that after about fifteen years of painting I was amazed by the difference it makes. All in though, you're making good progress. You've got a scheme you like and you're cracking on with real enthusiasm. Keep up the good work! Thanks Stercus! Making this thread really helped. You can thank 12 year old me for the scheme, that kid sure knew what he was doing! P.S. 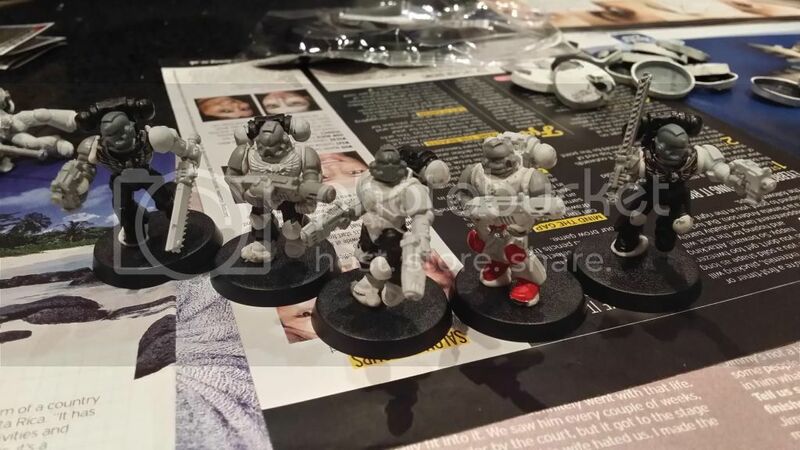 Just got my BA Tac squad and looked at the sprues, so much awesome! Other things besides water to help you thin your paints: Liquitex or Winsor & Newton Flow Improver. It says to dilute the W&N stuff, but I've found no reason to do so on my wet pallette. Mix of 1:1 or 2:1 medium:paint seems to work great, even with metallics. I've tried using Liquitex at about an 8:1 water:flow improver ratio, and a drop of that can drastically help out a thicker paint. I apply that mix maybe 1 drop for every 4 drops of paint (totally eyeballing that mix) and it's a pretty good sweet spot. Of course you want to use more or less depending on how thick the paint is already. That's not to say it doesn't help with normal, fresh paint. It's just a useful factoid to be aware of. Edited by Firepower, 19 December 2014 - 01:17 AM. Awesome sauce. Where is the best place I could buy this in the UK do you guys know? And if it helps I'm using GW paints, all bought within the last Month. Hopefully I'll get some time this evening to detail my fodder and make a test on a Death Company too! 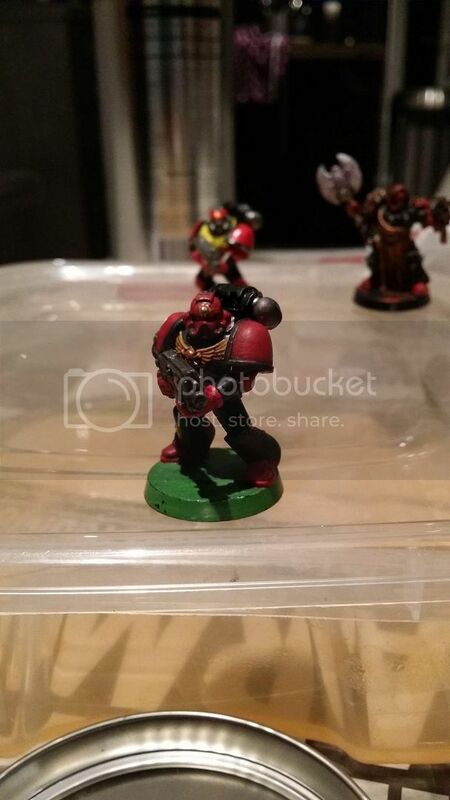 Pretty sure I've just found out how to base my models! The green will be a really cool contrast! Still lacking in the Inferno Pistol Department (but that's what the Sang/ DC boxes I will soo be getting are for....) so please ignore the stand in pistols! Saved the best for last, love the sergeant here! P.S. How killer does 32mm look?!?! Edited by Charlo, 15 January 2015 - 10:14 PM. Not bad, its nice to see a technique develop and improve. 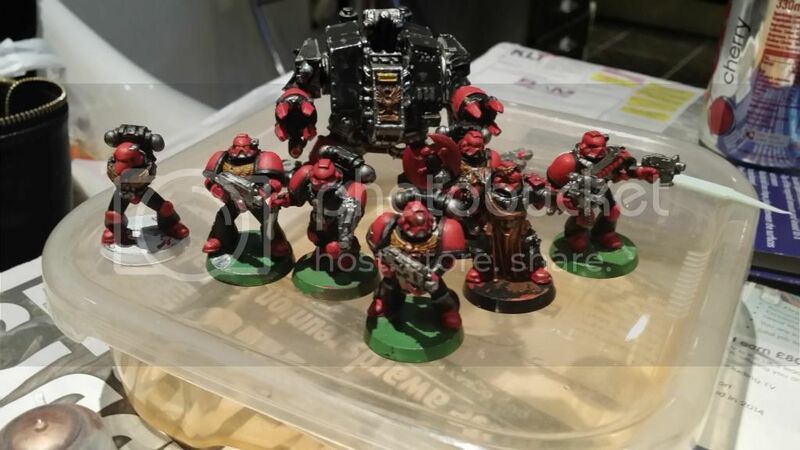 Got some Halfords Matte Black Spray and got happy on a LOT of models and pieces over the weekend, including ten Marines what will become two Meltacide RAS and some other random characters. Only shame is that with the bit of what that was on some of them the undercoat is erring on the thick side, but I'm confident they'll look cool once finished. That and the kits are all a little old, hopefully some of the new BA heads and shoulders will rectify this! Side note: May give up on the red codpiece though - it's proving a massive pain to keep painting for little gain in the overall scheme... I'll keep a mini unpainted and compare later. 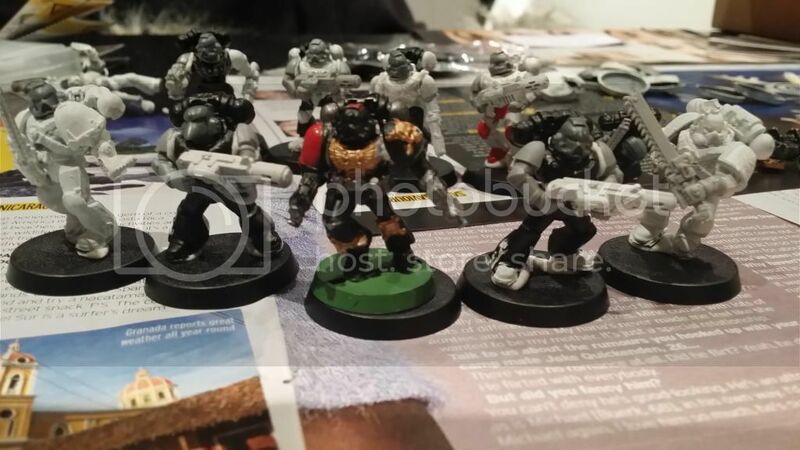 Classic Chaplain with head bionics, Classic Apothecary, Classic Chaplain with Skull helm, Veteran with combi Plasma, Games day 20XX Veteran with Powerfist, Classic Tech Marine, Scratch Built Librarian. Edited by Charlo, 09 February 2015 - 10:50 PM. 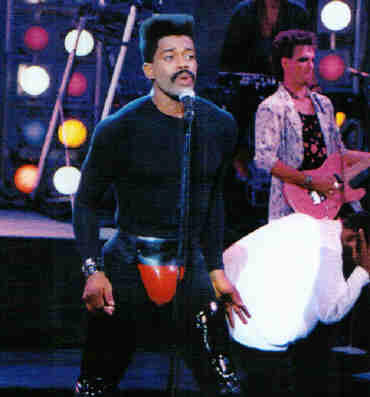 Red crotch or no red crotch? I think it might actually be a little too much red, and maybe detracts from the rest of the scheme. What do my brothers think? Edited by Charlo, 10 February 2015 - 12:15 AM. You're too young for this I'd imagine, but the red does remind me of Cameo. Whether this is a good or bad thing, I can't decide. Word up !